I am pleased to announce the release of my latest novel, Surviving Immortality. The story’s premise and its characters knocked about my head for three years before I ever put pen to paper. It started when I began studying what I believe are man’s most negative traits: lying, greed, and lust for violence. I wanted to explore these traits in story form, and I eventually got the idea of pitting these attributes against each other to see which is the most destructive. The tale pits man’s greed against gun violence while wrapping the movement of the characters in a web of lies and half-truths hidden in chilling truths. By the time I finished I was surprised to find I had created an action thriller that pits innocence and integrity against unspeakable evil, all riding on the shoulders of a love story. It’s the saga of a man who discovers the fountain of youth, a formula that will make old people decades younger and keep people youthful and healthy for several thousand years. But he tells the world he will not divulge his formula until every gun, tank, battleship and bomb has been destroyed. When the world is free of all weapons, then everyone will live forever. And then he goes into hiding. Before he disappears, his gay step-son (the protagonist) accidently exposes himself to the treatment, becoming immortal. The stepfather takes his son into hiding with him. They become fugitives, carrying the most priceless gift in history. But of course, not everything about the miracle formula or its inventor is what it seems. The innocent protagonist quickly becomes ensnared in a web of lies and half-truths, and he doesn’t know who to trust or which way to turn. In a world where humans must choose between security and immortality, which one will they collectively choose? The choice is not as simple as one would think. Which government will risk putting themselves at the mercy of all the other superpowers by abandoning their military might? Destroying nuclear warheads is one thing. Destroying all forms of defense is a whole different ball game. And how many gun zealots would hand over their stash of AR-15s? And if not, would they organize and fight back in order to keep them? It’s a choice that could easily splinter our country and the entire world. On top of a planet torn apart by different factions, a chilling truth is uncovered… We are a species on the brink of an unprecedented environmental crisis. Climates are radically changing, forests are disappearing, lakes and rivers are being poisoned by pollution, our food is contaminated with lethal pesticides, and forty thousand species of plants and animals go extinct every year. That’s roughly one species every twelve minutes. And the worst case is the submarine disaster of oxygen-making plankton perishing in fouled seas. With current manufacturing and farming technologies, scientists agree this planet can comfortably support roughly four billion humans. We’ve now surpassed eight billion, and that number will skyrocket to twenty-one billion souls in the next twenty years. When that happens, famines will breed plagues to level the entire population. Wars over food and water will be the order of the day. Insects might survive, but not mammals, birds, fish, or amphibians. And certainly not humans. Our species is already racing toward annihilation due to overpopulation. And to introduce immortality to eight billion souls at the current birth rate—with nobody dying to make room for new souls—would bring an end to civilization in the next few generations. Unless man changes his breeding habits, people living now could see the end of our civilization. 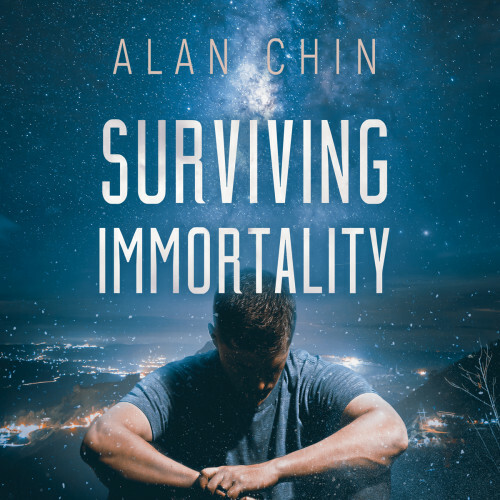 Surviving Immortality is a poignant commentary on human greed, man’s lust for violence, and the effects our species is having on our environment. It’s a tale of a world gone crazy, driven to the brink of destruction by the promise of immortality, and of a gay man who realizes the courage, the will, and the compassion to combat the insanity, both within himself and outwardly. And as with all Alan Chin novels, there is a love interest. Along the protagonist’s journey, he finds more than he bargained for—a deep and abiding love that gives him strength during his darkest trials.